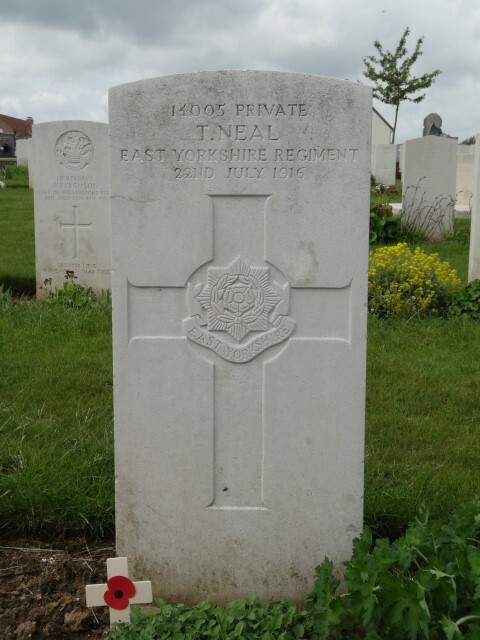 14005 Private Thomas Neal, 8th Battalion, East Yorkshire Regiment died of wounds 22 July 1916 and is buried at Mericourt-L’abbe Communal Cemetery Extension, France. He was 35 years old and is commemorated on the memorial plaque on the St. Helens Colliery Memorial Cottages. In 1881, the family lived at Tindale Crescent. William aged 49 and his son Henry aged 17 were both coal miners. Thomas’ mother Ellen had died by 1891 and his sister Sarah had married David Davis from Shropshire. By 1901, the Neal family lived with Sarah and David. At this time 20 year old Thomas worked underground as “a hauling machine tender”. By 1911, 30 year old Thomas still lived with David and Sarah Davis and their 6 children at Tindale Crescent. He was a coal miner (hewer). Thomas Neal was 33 years 11 months old when he enlisted 30 October 1914. He was 5ft 4” tall and weighed 127 lbs. He had a sallow complexion, blue eyes and fair hair. His religion was Church of England. Private Thomas Neal was given the regimental number 14005 and transferred from the depot to 9th Battalion, East Yorkshire Regiment 12 November 1914. 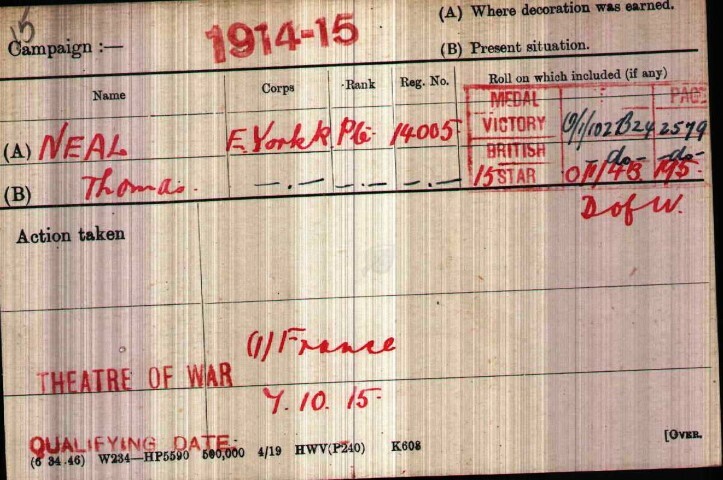 7 October 1915: on joining the BEF in France, he was posted to the 8th Battalion. 4 July 1916: marched to Cardonnette. Private Thomas Neal was awarded the 1914-15 Star, the British War and Victory medals. Another miner who worked at St. Helen’s Colliery to serve with the 8/East Yorkshires was Private J.E. Hodgson and he died of wounds 20 July 1916 in this action. Private T. Neal is buried at grave reference II.C.14 Mericourt-L’Abbe Communal Cemetery Extension, France.